From the vantagepoint of the "modern" world, religion has often been viewed as a lingering artifact of ancient times. Over the course of the 20th century all too many folks have argued that the world was witness to an ongoing process of secularization, leading some to proclaim that "God is Dead!" Such mixtures have often involved an ironic - and at times apparently contradictory - creolizing of things old and new, all testifying to what it means to be called a religious modern. Recently, while spending time with my nephew and niece I had the chance to suffer, while admittedly laughing, through the profane hilarity that is Eddie Murphy's humor in his recent film Norbit, only to the see the movie end and seemlessly transition into the credits while Kirk Franklin 's gospel played in the background - for some this is a no doubt a troubling example of modern religion. Only a few days earlier, however, while reading the Sunday New York Times, I was introduced to an image that I just had to share. What follows is an incredible example of urban religious modernity twenty-first century style: a mass street baptismal service hosted by Harlem's United House of Prayer for all People - the church founded by Charles "Daddy" Grace. See the below article and check out the video footage at the following link: Reborn in Harlem and let me know what you think. LAST Sunday, an 82-year-old woman from Jamaica, Queens, named Beatrice Vaughn, dressed all in white, donned a straw hat covered with brightly colored plastic pompoms and set out to cleanse her soul. It was time for Ms. Vaughn and the other members of her church, the United House of Prayer for All People in Harlem, to be baptized. 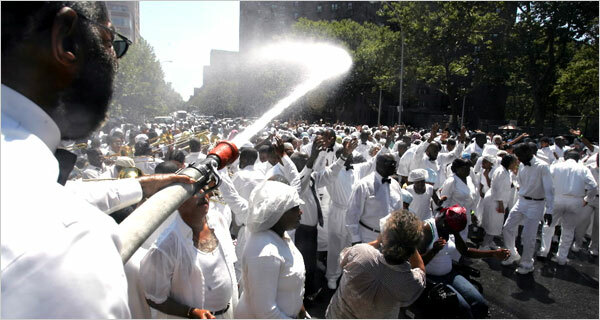 On this and every other first Sunday of August since the 1930s, hundreds of church members clad in white have gathered on a closed-off section of West 115th Street near Fifth Avenue to wash away their sins and absorb the healing power of a blessed water that rains down on them from a fire hose. Ms. Vaughn danced out in front of the crowd, shuffling her feet and bobbing her unmistakable hat to the infectious sound of a brass band. Around her was a sea of white. “I have the Holy Ghost and fire in me,” she said later. Occasionally, a pair of hands would rise above the crowd and shake, palms forward, as if soaking up the energy. At midday, three cars inched through the gathering. Out of one of them popped the church’s national leader, Bishop S. C. Madison, who is 88 and is affectionately known as “Daddy Madison.” A frail man in black robes whose gray hair grazes his shoulders, the bishop was helped up the stairs to a small wooden stage. He, too, began to clap and shuffle. Minutes later, an arch of water gushed out of a hose onto the crowd. Under the downpour, the band continued playing, the faithful kept dancing, and a year’s worth of troubles of the soul were washed onto the hot asphalt.